We are proud to announce a new version of Meliora Testlab “Lonely Cicada”. 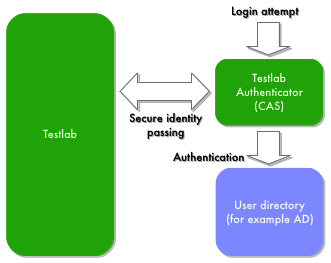 This version brings you many usability enhancements and notably, a possibility to integrate your Testlab to your own central authentication user registry. The version is live immediately and all the features and changes described below are now available! Lonely Cicada implements a support for an external authentication source with SSO (single sign-on or, more appropriately, enterprise reduced sign-on). This allows your Testlab to be integrated to your organization’s own user registry, for example Active Directory. This way the password authentication is made against your centralized credentials with reduced time spent on login prompt. This version implements a set of changes to requirement management functionality which integrates requirement design and test case design more deeply. Test case hierarchy is integrated to requirement design view. This allows easier transitions between requirements and test cases. Verifying relations can be drag’n’dropped directly between the trees. 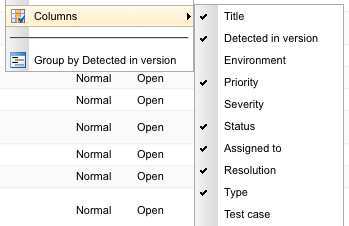 Test case edit can be initiated directly from requirement design view and adding a new verifying test case is now easier via the requirement design view. Requirement tree now holds a “Show verifying test cases” checkbox which allows you to show the requirements’ verifying test cases in the requirement tree when preferred. Comments are moved directly to the details view from the earlier placement of a separate tab to make them more accessible. “Search:”-filter in requirement tree now searches the content of custom fields. 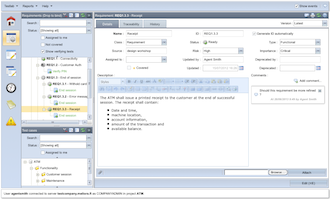 When adding a new requirement the requirement can be directly added to the workflow status desired. Previously, the asset was always created to the initial status and a separate edit for approving the requirement was required. We believe these enhancements make working with requirements more easier for all our users. Testlab user interface now holds a set of so called quick links which allow you to quickly move to the asset referred. Coverage view tree view is now interactive so that the actual coverage data can be drilled down to individual assets. You are now able to click the test results and calculated summaries to open up a floating panel allowing access the assets included. .. take you directly to the clicked asset. Listings and grids in Testlab allow you to pick the columns, sort and group the content as you wish. Great, and this is now enhanced by the fact that the settings you’ve chosen are now saved to your browser settings. This way the views open up as you’ve set them up in your last session without the need for resetting them again. Added a button to the issue listing which allows you to add the test case related to the issue to your work set. This makes it easier for you to pick the test cases to your next test run via the issues view. Added a “severity” field for issues. If your project’s issue management process requires a separate severity for the issues in addition to the priority field just enable this field in your project’s settings and you are good to go. Added “Trivial” level for priority. The title bar of the issue listing now holds the count of filtered in issues. Added quick links to the related assets such as issue’s test case and test run (see above). When working with Testlab you are always connected to a specific project of yours. Previously switching between your projects required you to relogin to Testlab. The new version allows you to quickly switch between the project’s you have access to by selecting the project from Testlab > Change project -menu. Comments have been moved directly to the details tab. This make the comments more accessible for users. “Search:”-filter in test case tree now searches the content of custom fields. Test cases can now be added directly to the workflow status desired. Previously, a separate edit was required for example to approve the test case. Test case related reports can now be generated via context menu of the test case tree. Listing of test sets is not grouped anymore by default to make the view more accessible. Test set editor now shows the priority of added test cases. 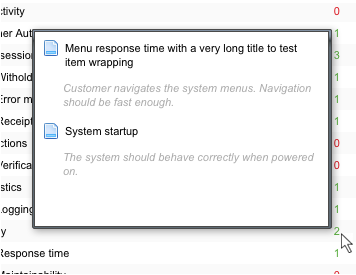 Test set tree has now a hover tooltip to show the description of the hovered test set. Test runs can now be permanently deleted. A “testrun.delete” permission is required which is by default granted to all TESTMANAGERS (and ofcourse, administrator users). Test run listing is now grouped by version by default. Streamlined attachment controls: Attachments are now listed inline and removed by clicking the cross-symbol after the attachment. From now on, the history regarding attachments now show the file size of the added attachment. “user.add” permission now grants the editing permission for users. All users in PROJECTMANAGER roles now have the permission to add users, but can only grant access to the project they are currently logged in to. Added a new custom field type which allows you to select an user. We would like to thank you for all your feedback and we hope this version makes the use of Testlab even more productive than before. Lonely Cicada? There is a genus of cicada in North America (Magicicada) which spend most of their 13 or 17 year lives underground. After 13 or 17 years, mature cicada nymphs emerge at any given locality, synchronously and in tremendous numbers. After such a prolonged developmental phase, the adults are active for about 4 to 6 weeks. Within two months of the original emergence, the life cycle is complete, the eggs have been laid and the adult cicadas are gone for another 13 or 17 years. Time after time something disturbs this cycle of individual cicadas and a single cicada can emerge from it’s safe-haven of underground out of this 17-year cycle and enter the brave new world without the company of any of it’s kind. If something should define lonely we think this is it. Happen to be at east coast North America ? There is an emergence of cicadas happening right now and you can actually build a sensor to track cicadas at your location. Or just track them via online map.